CBS announced the latest set of teams for the fourteenth season of The Amazing Race (set to premiere on Sunday, February 15th), and it didn't take long for savvy TV and film bloggers to notice a familiar name among the contestants: Mike White, the veteran screenwriter whose most famous credits include Chuck & Buck, School Of Rock, Nacho Libre, and the cult TV series Freaks & Geeks and Pasadena. White has also appeared in many of the movies and shows made from his scripts, so his pasty, mousy appearance and meek demeanor should be familiar to fans of offbeat entertainment. 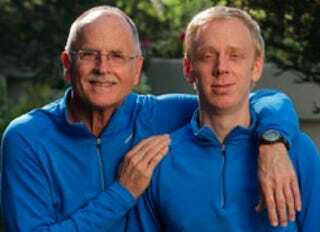 According to CBS, White will be racing with his father Mel, a former right-wing speechwriter and pastor who came out as gay in 1994 and became a gay rights' activist. The CBS write-up says the team "might not be the most physical team on the Race, but they’ll surely compensate with their wit and communication skills." So that's something to look forward to. Will this pop culture crossover be enough to get The Amazing Race added to the TV Club rotation? Probably not, but it may have just earned the show at least a one-off review. Stay tuned.